BY THE REV. H. J. GRIFFIN. Under the empire of Caesar Marcus Piavonius, Victorinus the fortunate, pious, unconquerable, Augustus, chief Pontiff, invested with tribunicial power, father of his country from Lindum to Segelocum, fourteen miles. Victorinus, one of the thirty tyrants, achieved a certain modicum of power during the reign of Gallienus. He succeeded Laelianus in the province of Gaul in 268, but only held power for a few months. The handbook of the Museum at Lincoln says he reigned from 265-267, but Gibbon says otherwise. Littleborough dominated the ford on the line of the great road from Lincoln to York, via Doncaster. The famous ferry, which, alas! has been stopped, was supposed to be the oldest in the county, and had been used without intermission, since Roman times. It is an odd commentary on our much vaunted modern developement of the means and facilities of communication, that a line of road, utilised for such a long succession of centuries, should lapse at this late date. At one period this Littleborough had a large and flourishing population, but at the present time there are only forty inhabitants. 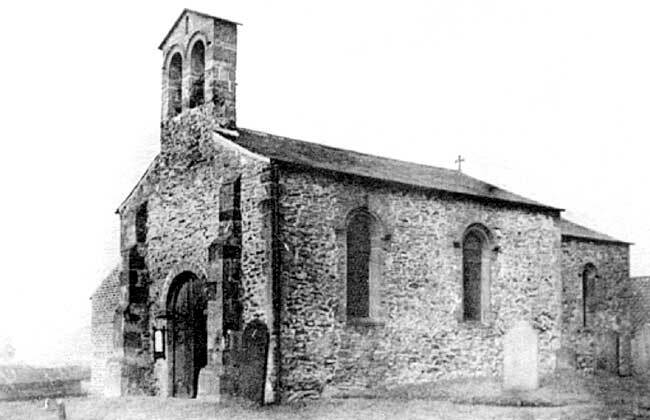 The parish church, dedicated, there is good reason to believe, to St. Nicholas, is claimed by some to be the smallest parish church now in use in England. There is a perfect Norman chancel arch which has remained untouched, except by the hand of time, and in the outer walls of the chancel and nave are fine specimens of the herring-bone style of masonry. As the church does not appear in Domesday Book, William the Conqueror has been thought by some to have been the founder, Littleborough being part of his great manor of Mansfield. It was at that time adequately endowed. The endowment in this parish was upset by King John when Earl Mortain. He being at Nottingham gave to the church of Wellebec and the monks there, whatever belonged to him of the church at Littleborough, with the appurtenancies, viz., the advowson and presentation and the very church to be converted to their proper uses, as much as belonged to him or his heirs, and Geoffrey Plantagenet, Archbishop of York, appropriated it accordingly to that abbey. At the dissolution the greater part of the endowment of the parish passed away from the church altogether into lay hands, a very small pittance being left. it is the opinion of some, however, that part of the church was built early in the 4th century, and they point to the Roman bricks and Saxon masonry! Littleborough is the supposed scene of the memorable baptism, when a great number of people were baptized in the river by Paulinus, under the eyes of King Edwin himself. The latest edition of Bede's History confirms this opinion. There is a piscina, which has been defaced; an old "tub font," which, unfortunately, has been tampered with; and an ancient window on the south side of the chancel. There appears to have been a door in the south wall. There is a silver chalice with cover, dated 1571. The register of baptisms, marriages, and burials dates from 1539. The church was carefully restored in 1900 at a cost of £300. There are few ancient churches so little altered from their original state. Piercy records that when, in 1684, the lands between the bridge and the "town" were first ploughed, numerous coins of Nerva (96-98), Trajan, Hadrian, and Constantine were found, also urns. In 1718 two Roman altars were found; in 1759 a curious watch-tally, or pass. A most interesting find occurred in digging a grave in the churchyard about 1860. The gravedigger, having cut extra deep, struck the top of a Roman stone coffin, and called in a neighbour to help him to lift the massive stone cover, on raising which the men, for only a few seconds, saw within the coffin the perfect body of a young woman whose funeral garment was clasped by a Roman brooch. After a few moments' exposure to the air, all collapsed into fine dust, to the great astonishment and alarm of the men. This coffin is now in the cloisters of Lincoln cathedral; the brooch is now in the possession of Mr. E. Wilmhurst, of Retford, to whom I am indebted for much of the above information. Mr. Wilmhurst has also two small coins of Constantine, found in the neighbouring fields, and the finds still continue where deep trenching upturns the old Roman level of the land. Mr. Foljambe, the patron of the living, has at Osberton a Roman altar, taken from the Trent here, the only remaining words meaning "dedicated to." Stukeley in his Itinerarium. gives a bird's eye view of Littleborough as it was nearly two centuries ago. Four miles from Littleborough the village of North Leverton was passed through, and South Leverton soon reached. Unfortunately, the party was behind time at this part of the journey, and the inspection of the interesting and spacious church of All Saints was of necessity shorter than was desirable, and was further curtailed by the fact that the vicar and Mrs. Clarke had most considerately and kindly provided tea in the parish room for the visitors. Through stress of time, the vicar took the opportunity of reading a paper whilst tea was in progress. Enough, however, of the church was seen to satisfy the members that it is one of the finest churches in the district, and it and the churchyard are maintained in most excellent condition.